Inclinometers are designed to measure angles of tilt with respect to gravity. They are also known as tilt meters, slope gauges, gradient meters, level gauges, pitch and roll indicators, etc. Electronic inclinometer sensor has absolute high accuracy finding applications in civil engineering, commercial products (e.g. camera, video game devices), science research, military, automotive safety systems, aircraft and industry process controls. Clinometer or tilt monitor are inclinometers incorporate with a tilt sensor and conditioning electronics while the single and dual axis electronic inclinometers we provided are fully signal conditioned tilt sensors with measuring range up to ±90°. High performance wireless inclinometers (±15°, ±30° or ±90°) based on MEMS technology with integrated data logger are also available for dynamic measurement on embedded equipment, vibration analysis, inertial measurement as well as structural health monitoring (SHM). 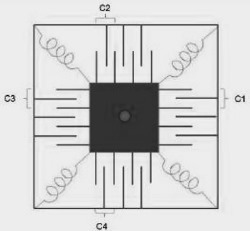 Two well-proven methods for measuring tilt or inclination are micro-electro-mechanical sensors (MEMS) and electrolytic sensors (fluid cells). For devices built around MEMS sensors, a small mass is suspended by an arrangement of elastic springs. When the device tilts, the mass moves slightly relative to its supporting structure. This change of position causes a change in the electrical capacitance that can be picked up by the device’s electronic system. Then, the electronics system translates these subtle changes in capacitance into tilt measurements and prepares the output signal. MEMS inclinometers are compact and rugged and can operate reliably over a wide range of operating temperatures. The Fredericks Company expands line of microprocessor-based analogue output Dual Axis Inclinometers including RS 232 and RS 485 serial interfaces. The high impact plastic housing enclosure provides long-term reliability and environmental durability of the inclinometers. All inclinometers are designed for easy use and interface with all types of instrumentation and equipment, offer an angle range of ± 60º over (X & Y axis), 0.2 arc minutes resolution (0.003 degrees), and +/- 0.1 degrees repeatability. Custom angle ranges are available. They are RoHS compliant, consume low power and provide higher IP66 rating. Typical applications of those inclinometers include yet not limited to aerial lift platform levelling, monitor or control, crane boom angle measurement, robotic controls, satellite dish alignment, solar panel position and elevation control, wheel alignment systems, alarm system activation, machine tool levelling, and medical equipment positioning and monitoring. While the vast majority of wireless sensors show their limits in harsh industrial environment, our BeanDevice® HI-INC XRange from BeanAir integrates an innovative antenna diversity design, boosting the radio link quality in environments subject to random and diverse disturbances. Antenna Diversity improves both the quality and reliability of a wireless link by 30%. The wide range of industrial protocols available on the wireless device (ModBus TCP/RTU/ASCII and OPC DA) that enable an easy integration into your IT environment. Please complete the enquiry form below for specific information and advice on 1 & 2 Axis Inclinometers.